Years went by and it occurred to me that I could pick up a stick as easily as anybody else and carve it. I looked for directions on the Internet and found a small pamphlet titled, “How to Hand Carve a Wooden Crochet Hook”. I purchased the book and a gauge from http://www.gourmetcrochet.com/ and there they sat for awhile. I read the book and there were a few things that puzzled me, but I wasn’t yet ready to start. I still had beginner’s feet or cold feet as some people call them. A few months after I had purchased the pamphlet I was at the home of my friend, Barbara. Her husband Charles showed me beautiful walking sticks he had made from large sticks he’d picked up when he was out in the woods. The finish on the sticks was exquisite. He explained that he removed the bark, sandpapered the wood and then patiently began applying many layers of Tung oil until finally the wood was protected, felt like satin to my hand and gleamed. Again, I was entranced. I remembered the crochet hooks I had plans to make and it occurred to me that I might be able to get started on the project. First, though, I went to Charles with my questions. He gave me different grades of sandpaper and different kinds of steel wool to use. He lent me some Tung Oil and gave me a knife and I was on my way. The first few attempts I made took some time. My right wrist and left thumb were very sore. I learned to wear my wrist splints and to cover my thumb with a Band-Aid until I could develop a good woodworker’s callus on my thumb. I learned not to carve when I was tired. That was when I would cut too deeply and slice the hook right off of the business end of my project. I also learned to take smaller cuts in the wood. I learned termites and wood burrowing bugs lived in the branches I took home from the big Redwood tree next to my building at work. At first it alarmed me that my hook was damaged. But, then, I realized that the defects were actually interesting and continued to use that particular wood. I learned Redwood is very much harder than the white oak sticks I picked up other places. Now, I’ve got people on the lookout for sticks for me. Charles gave me some fruit wood from a cherry tree in the neighborhood. I begin a project by removing the bark from the stick. Sanding takes a long time and I discovered that chipping away at the bark with my X-acto knife was faster. Then, I begin to sand the stick. At the same time I pause often to hold the stick in my hand to see which way the hook wants to go. They aren’t always straight and when there is a slight bend to the branch I don’t want my hand to get fatigued as I work the hook later on with yarn. So, I turn it about and about until I get a grip that feels good to my hand. Once the stick is relatively smooth I make the cut for the hook. I’ve got a small coping saw that I hold at a 45 degree angle about half an inch or more from the end of the hook. I saw almost half way into the stick. From there I pick up my knife. I have 3 of them that I’m using. One is a heavy duty X-acto knife. Another is a smaller X-acto craft knife. The third one is rather pretty and is called a whittling knife. There are times when I will use all 3 of them during the course of a project. It just depends on how I feel. Lately, I’ve been working on the slant into the hook area first. When I’ve got that area going I will go to the top of the hook and work on the tippy part. When it starts looking like a crochet hook I will begin to size it in my gauge. I tend to make them starting at a larger sized hook of L and M and work my way down in size to the smallest I made which might have been an F. Smaller than that and I don’t think the wood would be sturdy enough. The directions in the pamphlet cautioned against sanding the underside of the hook, but so far I have yet to make a nice smooth cut with the saw, so I gingerly sand it with the flat side of a small file I got at Home Depot. Actually, it’s a whole set of them, but the only ones I tend to use is the flat/domed on the other side file and a small round file. I use the round file to put a smile on the hook when I’m almost done. I alternate between carving and sanding as the hook begin to find a good size. I size it in the gauge both for size and to see that I’m approaching a roundness on the hook. I don’t figure it would matter to be a size G one way and a size H the other, but I am a Virgo and I want it to be “right”. It was tough for me to figure out where to place the gauge to determine the correct size. I did go grab a couple of my “bought” hooks and sized them. Imagine my surprise to see that they were not consistent. No wonder they give a gauge to work to at the beginning of a pattern. However, I have sort of determined that I need to size a hook about one and a half inches from the tip. I keep several balls of yarn nearby that I use to see how the hook I’m working with feels using it to actually crochet something. I also eyeball wherever the yarn ends up at the fattest part of the hook (that inch and a half down) to see if I am positioning the gauge in the right place to get a correct size. With my first hooks I used a wood burning set to burn in the size. The very first one I did was a J. I made the J backwards and kept looking at it because it seemed strange to me. Well, a few days later I realized I’d made a backwards J so I dragged out the wood burning set again, turned the backwards J into a flower and put a proper J on the other side. Then, I burned my name on the hook. I have given away a bunch of the hooks I made. Mimi, a lady at my husband’s work, made a cute blue and white purse for me with the hook I gave her. In line at the True Value hardware store across from where we live and where I purchased many of the supplies I use I gave one of the hooks to a cashier who said he crocheted. It was so funny the first time I was showing off the hooks to him and his buddy was hanging over his shoulder to see what he was doing. He said to him, “Yes, I crochet.” in an exasperated tone of voice. The next time I was in the store I gave him one of the hooks. The guy behind me in line was amazed. He said I should be selling them and maybe someday I will. 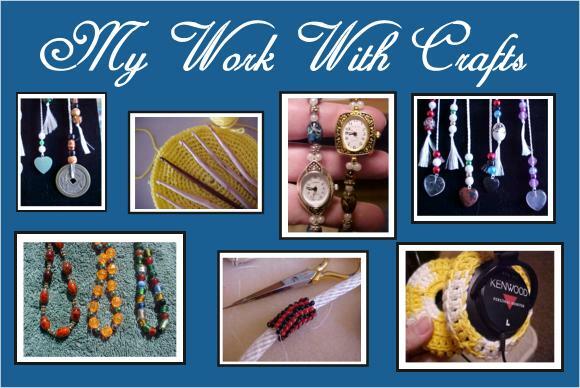 He said to me that his elderly aunt crochets, but she has arthritis and can’t do it as much as she’d like. I looked at my hooks and found the one I’d made with a big handle just for somebody who might need a better ergonomic grip. I gave it to him and said it was for his aunt. The man said the hair stood up on the back of his neck he was so surprised. It makes me feel good to give away these hooks. I’m still learning how to make them. Each one I make I am able to focus in on a different aspect of the hook and each hook is different. I’ve learned when I work on the wooden dowels I bought from the craft store that wood is almost like butter and I have to be careful not to take deep cuts because they generally result in a huge splinter coming out and ruining the piece. I’ve also gotten some good tools made out of the pieces that don’t make it to a successful crochet hook. Charles told me to use a piece of wood on the crochet hooks as a burnishing tool. So, one of my failures is used for just that purpose. It puts a sheen on the hook, it seems to even out dents and cuts that I didn’t mean to leave, it almost seems to harden the wood. Another piece I tried to turn into a letter opener, which didn’t work very well, but I kept it and wrapped a piece of 400 grade sandpaper on the flat end to help when I want to finely sand the underside of the hook. One of the things I’m experimenting with now is with the finishes I’m putting on the hooks. I began using Tung Oil. The first coat would be dry in a few hours. The second coat took longer and subsequent coats of Tung oil took even longer to dry. In fact, I had some hooks that didn’t completely dry out until after a good 2 weeks. But, even after that somehow the surface of the hook didn’t have as smooth an action as I hoped for. The surface of the wood was like glass and just beautiful to look at, but somehow it hadn’t resulted in a fast hook. I bought some Min-Wax stain and tried that, but I wasn’t all that pleased with the result. The stain seemed to come off on the yarn and that wasn’t good at all. I probably didn’t use it right, so the stain has been put away for another day. Then, I thought why finish them at all. Once they had been sanded down with the 400 grit sandpaper they were quite lovely and had a good action when crocheting. However, weekend before last I was over at True-Value hardware store and saw where the stain was being sold. There was a big display that illustrated all the steps in finishing a piece of wood. Step one was the stain. Step two was a protective coating. I thought that’s what I had left out. So, I bought two cans of Polyurethane in a clear satin and a clear gloss. I applied the clear satin to five hooks I’d made recently and I really, really like how they turned out. The directions said to put another coat on and I will do that this afternoon. I have really enjoyed making these hooks. It’s not that hard. It’s helpful to have somebody nearby to consult with who knows something about wood as you work with it. It’s wonderful to see the faces of people who crochet when they see the hooks and it’s especially nice to give them away. What I like to think of is the spirit of the wood. I hold a stick in my hands before I work with it and close my eyes. It’s almost as if I am asking the wood if I can work it into a hook. As I work with the hooks after they are made they are warm. I like this hobby. absolutely beautiful your artistry never ceases to amaze! Thank you Abhay. How wonderful too that I was just thinking about you yesterday and today you write to me. I am glad to hear that you are havng fun carving crochet hooks. I have a lathe and I make crothet hooks for people with arthritis and other hand problems. You are doing a great job, keep up the good work. I am always searching for "good" knives to use for carving hooks. My last trip to Home Depot I got 2 x-acto knives. One has a slender blade and the other is a normal sized blade, but the handle has a rubberized grip. Both are great to use. The one thing you want is a very sharp knife. With the x-acto knives you just replace the blades periodically. With the other blades invest in a knife sharpener or stone. Always carve slowly with tiny shallow cuts. If you carve when you are tired, stressed or upset in any way you can count on making a deep cut and either hurting yourself or possibly making a bad cut in your work. Now, if you make a bad cut don't worrry about it. Turn your work into something else. Once I cut the business end of the hook clean off. No good as a crochet hook anymore but I flattened out the end like a letter opener and used it to wrap a piece of sandpaper on to use as a sanding tool. I love your hooks. Your account of how you come to make them is wonderful. I have wanted to work with wood for years. Like you I have taken it up and then put it aside for another day. Maybe the next try is here with hooks or even needles. I will look into where I can get some harder wood to try using. Thank you for your willingness to share! Way back in the day, when I was 7, we took a trip to my grandparents house and my crochet hook got left at home. I was an incredible brat about it for the 5 hour trip and still when we arrived at the house. The next morning my grandpa presented me with a hook he had made thru the night. Thirty five years later it is still one of my most prized possessions. I've made a hook myself. This is a good article. Keep up the good work! But wood doesn't have a spirit. Trees don't have spirits. You can't ask them anything. I think polyurethane sounds like a great idea though, and making them with bigger handles for people with arthritis sounds great too! I LOOOOVE these hooks! I just recently started crocheting and would love to have a set of your hooks! Let me know if you are possibly making some to sell. I do realize that this post was from 2009 so hopefully you still make them! I stumbled across this post when I was googling about altering crochet hooks. Your description of how you like to give them away resonated with me. I, too, like to give my craftwork away; it's like spreading sunshine in the world. Too often people think that money is the only measure of something's worth. That is so blind. Thank you for this detailed account. I've been collecting sticks. My family thinks I'm nuts. Been wanting to try, but didn't even know what knife to use. Sooooo helpful. I love that you give them away. Such a blessing! Thank you for this article. I have been needing some crochet hooks but have been reluctant to buy because what is out there is mostly ugly or too expensive. This is perfect! I can't wait to start! Wow this is amazing. Hope you are still making these and gifting as you go. Hi Carol! I still have my tools at hand, though it's been some time since I made any crochet hooks. As Spirit moves me. Lately, I have been crocheting tiny little doilies and making them into book markers.